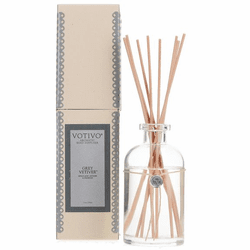 Soothe away your cares with an Aromatic Votivo Reed Diffuser, where every fragrance is inspired by essences of nature, for continual fragrance diffusion when a candle isn't convenient. Embodying the alluring mystique of gallant masculinity, Grey Vetiver huants sleek sophistication in the form of dry woods spiked with sharp citrus. Slivers of melon and bitter-grapefruit refreshingly muddle into herby birch leaf and briny marine accords. Smoky hints of vetiver wind through damp moss and smooth amber for a fresh out of the forest finish. Balancing powdery lightness with earthy intensity, White Iris bonds rooty accords with lavish florals for a fragrance that effortlessly shifts from sheer softness to weighty richness. Revitalizing bergamot and Ylang-ylang are cushioned by floral underpinnings of jasmine, violet, and rose yielding a breath of femininity. 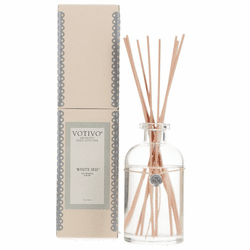 An earthy composition of iris, vetiver and amber leaves behind a trail of balmy, sweet woods. A seductive fragrance of time worn leather and sweet mulled spices brewed over an open flame, the aroma of tropical ginger comes as an invigorating surprise asshe strolls thru the late summer wildflowers on her way to her lifelong destiny. Trudging through the rugged Himalayans on the 15th day of the dark fortnight, the journeyman pauses to gaze at the black sky. The inspiring aroma of rare sandalwood inextricably interwoven with the scent of the delicate champaca petals soothes his weary soul as the whispering smoke of the nearby village ascends into the heavens. Indescribably complex yet simply by nature, Clean Crisp White defines the scentof our memories and a lifestyle worth wishing for: sun dried white sheets billowing in the crisp springtime morning, uncontrollable giggles as freshly bathed little bodies run thru the house, and an overwhelming aroma of nothing but clean.Ahh the simple luxuries of life. A gentle blending of recently mowed fescue and rye grass, the clean fresh scentis enlivened with the tangy appeal of red clover peppered with wood chips and earthen moss perfect for a day of self pampering under a blanket of white billowyclouds contrasted against the lush lawn of youth. The pervasive aroma from hand hewn cedar planks, bent twig baskets overflowing with sun dried sage and natural sweet grasses from the Dakota plains blended harmoniously with the peaceful quiet one only discovers when a forgotten memory is found. The fresh scent of an early wet spring brings to mind the youthful days of childhood past as you rolled the windows down and inhaled the sweet woody scent of wild honeysuckle tumbling over roadside bushes and blackberry vines; the aroma ishaunting as you travel by. A burst of freshly squeezed ruby red grapefruit juice splashes into the delicatecrystal goblet while hummingbirds sip their breakfast from trumpet vines entwining nearby pines; the early morning lifestyle of the sun-drenched coast. The scent of precious woods, aged figs from faraway lands, and hearty earthen spices filled the street vendor's tent with the taste of luxury that only the finest hand-knotted woolen rugs would bear; to inhale the aroma elevated one's senseof wealth. Ripples of scarlet undulate in steady waves as fields of dreamy poppy flowers invite the gentle white peony to drift into an intoxicating rhythm. The bright juiciness of red berries fall into step with dewy violet leaf as amber, sandalwood, and musk mingle in an alluring sensory dance. A savory blend of tart red currants and golden fruit glaze ladled over coarselyground vanilla bean ice cream and served along side of raspberry filled sugar cookies. the original Red Currant. Watered by an early morning mist, a verdant garden gleams with cool, dewy droplets and green, savory aromas. Crisp rosemary sprigs with lavender twists garnish a flavorful center of sage, basil, and thyme, while underpinnings of cedar and amber seamlessly dredge the fragrance in earthy zest. Rush of Rose is an explosion of fresh, green Damascus Rose buds, surrounded by light, watery notes and soft woods that bring a youthful revitalization to the Classical Rose of yesterday. Rolling waves of green shrubs blanketed by a purple coverlet of floral blossoms murmurs a soothing song of tranquility. A refreshing wash of white linen and seashore breeze gently gives way to soft lavender fields and a sweet grounding of tonka, vanilla, and patchouli. Swing open the door to a grand storehouse of aged oak barrels, brimming with theintoxicating aroma of spices, fermented fruit, and a delicate touch ofcarmelized sweetness. An ode to meticulously preserved tradition crafted withimpassioned expertise and exquisite attention to detail. Bursting with signs of renewal and rejuvenation, clusters of green burgeoning grass overtook the vast landscape. Revitalizing batches of fresh plucked lemons marinate in a grassy green bath infused with rich amber, energizing green tea, and musk. An aromatic blend of coarsely chopped dried herbs and forest floor earthen mossblended with an intoxicating masculine scent of moist skin fresh from a shower,Teak is a wood inspired fragrance designed to fill a room with exotic taste andlingering flavors of opportunities gone by and sensual dreams to come. Reminiscent of a time long past, the faint aroma of earthen pots overflowing with basil, oregano, and bay tempered with the light filtered blanket of clear pressed olive oil from the backyard trees; Tuscany's bounty' courtesy of Mother Nature. As the warm midsummer day drew to a close, the familiar sea salt freshness awaited their return' but this time was different; a smoke infused woodsy essence rose in gentle swirls from the beach side bonfire beckoning them to enjoy.